Said to have been the last full-rigged ship built in Massachusetts, the Mary L. Cushing was launched in Newburyport in 1883 by George E. Currier. Registered to Pendleton, Carver & Nichols of Searsport in 1895, and eventually sold into the salmon trade; disappeared from the register in 1907. Off Sandy Hook Light circa 1899. 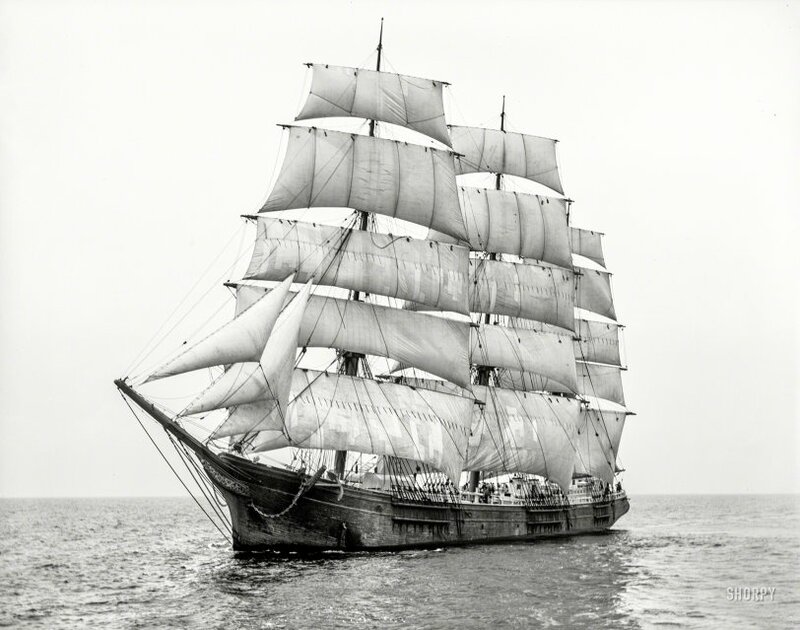 "Sailing ship Mary L. Cushing." 8x10 inch dry plate glass negative, Detroit Photographic Company. View full size. Submitted by Sarah Taylor on Tue, 06/05/2018 - 7:13pm. Full rigged vessels needed large (expensive) crews to operate and required men to go aloft (hazardous). Schooner rigged vessels could be operated by a much smaller crew, from the deck. Schooner rigged vessels were being built much later than this, and making money. Submitted by Jon on Tue, 06/05/2018 - 2:27pm. Quick bit of research reveals it being aground in Mazatlan in 1906.